Powered by the Firetip trading engine. 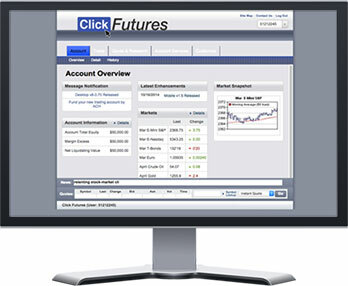 Take control of your futures trading with Click Futures. › Software Based – Available for both Windows and Mac. Experience our cutting edge trading technology allowing you to take total control of your futures & options trading. 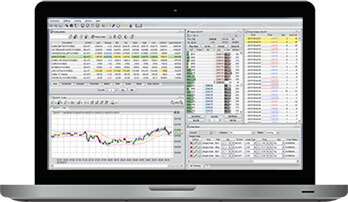 › Web Based – Login to your trading account through any internet connected web browser. In addition to full futures & options trading capabilities, the Web Based platform also provides full account management. › Mobile Based – Available for both iPhone & Android. Take your trading with you while you’re on the go. You’ll enjoy full account and trading capabilities in the palm of your hand. We support most 3rd party futures trading platforms that utilize a CQG or Rithmic data connection. 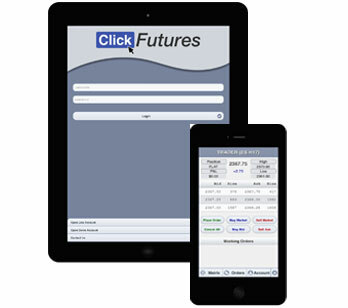 Contact us today for more details on using your own futures trading platform at Click Futures. To immediately receive your free, demo login access, please complete our Demo Account request form. Once submitted, you will receive an email message from our system with your unique demo account number and password which will be valid for 2 weeks from the date of submission. Please Note: This Demo is designed as an introduction to the platform and its functionality. It is not intended to mimic trading results in a live trading environment. In an actual live trading environment, Commissions and fees would be applied at the close of every business day, and a statement would be generated. Daily statements and the associated fees are not applied within the demo environment and as such, those fees, which may have a material impact on your account, are not reflected in final profit and loss calculations within this demo. Other factors such as latency fill price and execution times may also differ from live trading results. It is not intended for this demo to be an accurate representation of actual profits or losses that may occur in a live trading environment.